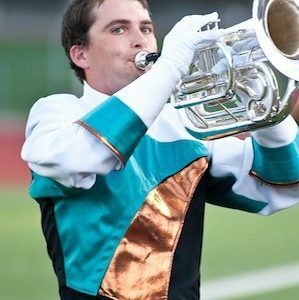 In this seventh installment of our summer 2010 series, Cameron Land from Pacific Crest Drum and Bugle Corps shares his feelings about ending the season at quarterfinals and still feeling like a champion. Today was quarterfinals of Drum Corps International World Championships. This was it, time to rehearse harder and more efficiently than ever before, right? Wrong. When the corps stepped onto the field this morning, it was no different, nothing had changed. The corps had been rehearsing “harder and more efficiently than before” the whole season, which is something I truly appreciated and respected. We had a short block, enough to warm up, and start working in ensemble. The rehearsal was quick, and before I knew it, it was time for our first performance of the day. When the run was through, we brought it in to listen to the staffs’ comments about the show and about the season as a whole. The whole time we were hosted at this high school, we had a constant fan. The band director, Stacey Briggs, had his son around, Keaton, who we accepted as a part of our corps. He spent from breakfast to lights out with the corps, stretching, watching basics, listening our horn line warm up, everything. When it was time to be dismissed, we had Keaton dismiss us. Of course, our drum major had to let him know what to say. After rehearsal it was to the food line, showers, and then on the buses. The whole day the corps was wearing its game face. We stepped off the buses into the familiar, hot, humid air of Indianapolis. We walked, we lined our horns, and we stretched to Michael Jackson. There’s something about listening to music while we stretch that pulls us together as a family, not just a corps. After a seemingly short warm-up, we threw on the “superman suits.” Then we lined up once again and headed back to the buses for a short ride to the stadium. When we arrived at the stadium, no one had much to say. Every member was aware of what their job was. We walked down into the cool, air-conditioned underbelly of the beast that is the Lucas Oil Stadium. We had a few minutes to grab some water and say what needed to be said to our friends. Then, we were walking again, to the tunnel. Of course, it was at this time that my contact lens decided it was going to be difficult. I hurried from the line to the bathroom to fix this problem. It didn’t get fixed before we went out, but it didn’t matter; I had so much adrenaline, I could have performed blind. When we took the field, we filled the place with confidence. We knew what we were there for. There was no second guessing, no “what ifs,” no “I wishes.” We set up on our opening set, and I took my normal time to acknowledge and appreciate the audience. 1, 2, snap …. I don’t remember much about the performance, just that I had a great one. We walked out of there champions, each and every one of us happy with our performance. I had left nothing on the field this year, no regrets. This year I learned to truly perform, and for once, I was happy, no matter what happened. Even though we were beat out of semifinals by only .45, I was still not upset. We were what we were, and that was good enough for me. I don’t march for scores anyway. One of my favorite parts about today was that it seemed the whole corps was content with where we ended up. We were happy with our corps as a whole, we didn’t need judges to tell us we were good. Cameron Land is a 3rd-year member of Pacific Crest. He marches trumpet and has played trumpet for 10 years. He is currently going to school at Saddleback College, working toward a transfer to Cal State Fullerton, and intends on majoring in music education. He also marched one season with Riverside Community College and will be returning this fall as they venture back to Indy for Bands of America Grand Nationals.